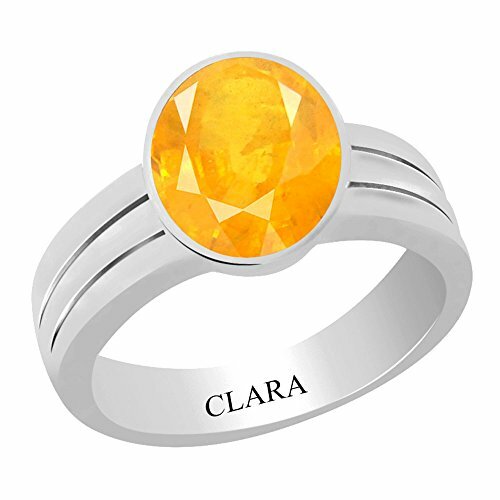 Clara Certified Yellow Sapphire (Pukhraj) 4.8cts or 5.25ratti Stunning Silver Ring-9@5330 Rs [Mrp:-11860] - Onlinedeals.discount - A leading product discovery website. Find the true prices of products, read reviews and buy top brand products at reasonable prices. BIS Hallmarked 925 silver Ring is artistically made according to the astrological needs. Gemstone is left open from the back side for rays to pass through and reach finger properly. High quality making in our own state-of-the-art manufacturing unit gives this ring a beautiful look. Gemstone certified by a govt recognised laboratory. Silver hallmarked by BIS. LegalDisclaimer Image shown is of real product but Product color may slightly vary due to photographic lighting sources or your monitor settings.